The tops of the bogie frame rest up against the two thick wires soldered across the underside of the loco frame. 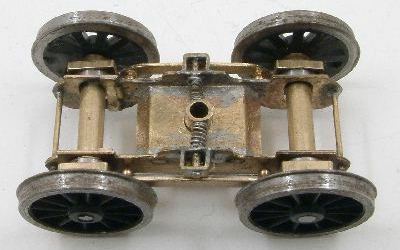 The bogie has been modified compared to the picture shown on the original version of this page: the axle tubes have been shortened to be flush with the outsides of the bogie frames, plus just a few thou for clearance. The bearings have been moved in to be flush with the outside faces of the equalising beams, aligning the beams with the bogie side so that the handrail knobs do not quite make contact with the frames. Alan Gibson 2mm bore x 1mm spacer washers between the bearings and the wheels take out the remaining sideplay. 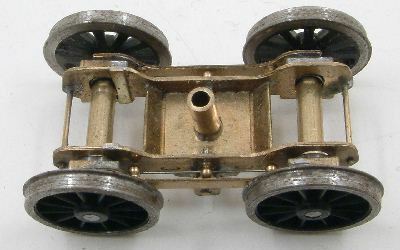 Each spring is carried in two handrail knobs on the equalising beam and a single handrail knob on the bogie inner frame. 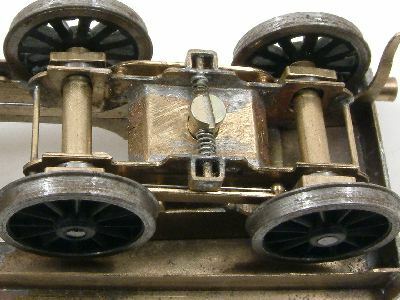 Top view – the bogie has a slightly elongated slot to allow the bogie some sideways translation relative to the mainframes. This is controlled by the coil springs underneath. Underside views. 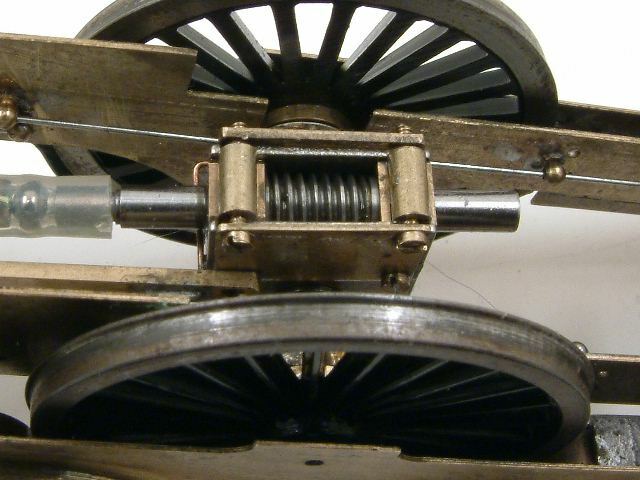 The centralising springs are held between the pins on either side of the frame (see the open frame view below) and small pins on either side of the bogie pivot sleeve. The set screw secures the pivot sleeve to the loco frames. Components: the ballraces are trapped within slices of square-section tubing. 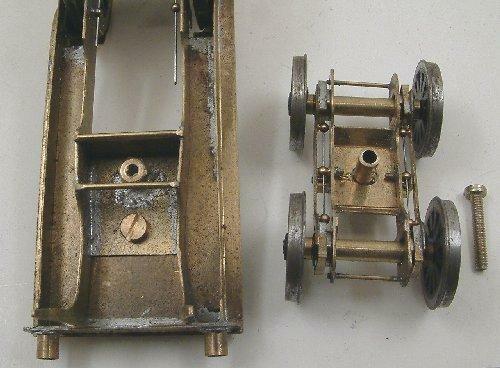 The equalising beams and frame are from a London Road Models Midland Spinner kit. 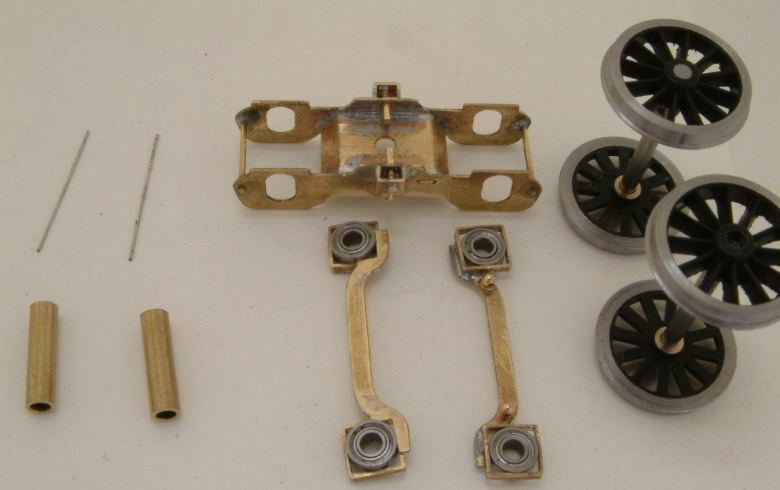 Wheels are Sharman, and the springs (guitar string) are carried by Markits 1.5mm diameter 1mm pitch 'original' type handrail knobs, two being attached to each end of each beam, and another attached to the midpoint of each side of the bogie frame. The axle tubes are a loose fit on the axles, and the axle tube length keeps the equalising beams at the correct distance. This isn't on the bogie, but shows the 40:1 gearbox on the main loco driver. The gearbox is an 'old-style' Exactoscale, with fabricated extra sideplates, and original spacers replaced with tube and 14BA screws. Since the input shaft is underneath the axle in this model, this is for added security, as well as improving the ease of assembly and disassembly. The springs on the driver are 0.020", over a 33mm span length.